Update 2: Via Twitter, we learned that Republican Jim White was appointed tonight by the Bernalillo County Commission to the House seat vacated by RJ Berry, by a vote of 4-1 (Hart-Stebbins voted no). Alan Armijo didn't allow any other candidates to be considered due to supposed time constraints. The Commission is dominated by Dems 3-2. I wonder what the outcome would be if the situation were reversed. Do you believe that Republicans would have appointed one of their own to a seat held by a Dem? You know the answer. Read more in a report by Marjorie Childress at NMI. Update 1: Please call Bernalillo County Commissioner Alan Armijo at 505-468-7185 and encourage him to appoint well-qualified BernCo resident Josh Anderson to the Mayor-Elect Berry's vacant NM House seat. Armijo will have a big say in the decision. We now have at least one Democrat vying for RJ Berry's House seat in District 20. As I mentioned late last night on Twitter and Facebook, AFSCME political director Josh Anderson is actively seeking appointment to the seat vacated yesterday when Albuquerque mayor-elect Berry resigned. Instead of representing his District at the Special Session of the New Mexico Legislature that begins at Noon on Saturday, Berry will be devoting his time to putting together a transition team and selecting staff to serve in his administration when he takes office in December. Berry's resignation was somewhat of a surprise as many believed he'd keep his seat until after the Special Session was completed. Before Anderson came into the picture, there was only one candidate seeking the appointment. Republican Jim White, a 67-year-old retired Air Force colonel has submitted an application to the Bernailillo County Commission. White lost to Berry in the 2006 Republican primary for what was then an open House seat, and has never served in an electoral office. He is a former treasurer of the Republican Party of New Mexico. Because the HD 20 seat is in Bernalillo County, the Commissions are taking applications for the slot, and will vote to determine who gets the appointment. There are three Democrats and two Republicans on the Board of Commissioners, and no requirement exists to require them to appoint a Republican to succeed Berry. According to news accounts, the Bernalillo County Commission may vote for a replacement for Berry as early as tonight, at its previously scheduled meeting at 5:00 PM. It would be wonderful to have a Democrat in Berry's former seat. If you agree, please contact your County Commissioner and put in a good word for Josh Anderson. This is especially important if you live in Berry's District. Click for . Click to find your . "Albuquerque voters today voted overwhelmingly for a Democrat to represent them as their Mayor. Marty Chavez and Richard Romero have received more than 55% of the vote. While there are still votes to be counted, it appears Richard Berry will be the next Mayor of Albuquerque. It is my sincere hope that Mr. Berry will work to unite the city of Albuquerque and respect its diverse population as we continue to make our way through difficult economic times." Update 11:13 PM: Chavez 35.05%; Romero 20.89%% ; Berry 43.88%; 181 Out Of 186 Precincts Counted. Voters approved all the bond issues, the transportation tax extension and the propositions to change the City Charter. Update 9:40 PM: Romero lagging with totals ranging from 23-25%, Chavez at 35-36% and Berry at 39-41% or so. Half of precincts counted. Chavez 35.68%; Romero 24.27% ; Berry 39.85% with some more Dem district results in. You can track the results of today's Albuquerque election at the . Vote tallies from the precincts should start coming in sometime after 7:00 PM when the polls close. Need Voting Info for Today's Albuquerque Municipal Election? After all the gnashing of teeth, knocking on doors, robo-calls, debates and discussions, it's time to VOTE in tomorrow's Albuquerque municipal election. The polls will be open from 7:00 AM to 7:00 PM on Tuesday, October 6, 2009. You must be registered in the City of Albuquerque proper to vote, and you must show a picture ID when you do (see rules). On the ballot will be the mayor's race, , a and . If you live in an odd-numbered City Council District, you will also be choosing a city councilor. Click for an official list of candidates and write-ins. If no mayoral candidate gets at least 40% of the vote total, there will be a run-off election on November 24, 2009 between the top two vote getters. Visit the Albuquerque City Clerk's page at www.cabq.gov/clerk/elections to check out the election info and click on the "where do I vote link." You can also go directly to a provided by the Bernaillo County Clerk to get the same info. These sources will also tell you in which city council district you reside. If you can't get through to the page, you can call the City of Albuquerque information line at 311, or get the info by calling the Democratic Party of New Mexico at 830-3650 in Albuquerque. Even if you think you know where to vote, please double check as some precinct voting locations may have changed since the last time you voted. The Albuquerque-Bernalillo County League of Women Voters has an excellent nonpartisan election guide. The Albuquerque Journal also provides a guide to the election. The City Clerk offers a . Note that the slot for City Council will vary, depending on your district. If you have an absentee (mail-in) ballot, it must be received by mail or in person at the City Clerk's office by 7:00 PM on Election Day, October 6, 2009. Absentee ballots may only be mailed or hand delivered to the City Clerk's office by the Voter, the Voter's immediate family member or the Voter's care giver. No absentee ballots will be accepted at polling places. You are invited to a an event for City of Albuquerque Mayoral candidate Marty Chavez. This is a non-fundraising event for members, friends and supporters of the LGBT community, to come together in celebration and unity. Click to see the entire email (pdf). As I've written before, Berry is one of those right-wing "marriage is for one man and one woman" guys. He's a dangerous foe of the LGBT community and doesn't even support domestic partnerships or civil unions, let alone marriage equality. Now we see that his supporters are also bragging that he's against a women's right to choose. And don't forget his hate-mongering on the immigration issue throughout this campaign. Berry is not exactly a civil liberties kind of guy. He apparently believes that his personal religious beliefs should trump the U.S. Constitution, and that Hispanics should be targeted and harassed to prove their US citizenship whenever law enforcement officials feel like it. LGBT citizens? In Berry's world, they don't deserve the same rights under civil law to which everyone else in America is entitled. What else can we expect if Berry manages to split the Democratic vote and win the mayoral election? If he implements the dangerous far-right agenda he's advocating, he just might roll back the green energy initiatives that are making Albuquerque a leader in the fight against catastrophic climate change -- and he certainly wouldn't advance any additional renewable energy initiatives. Remember, right-wingers don't believe that greenhouse gases are causing climate problems. Berry would no doubt implement a right wing social agenda. And he would likely adopt a wingnut crime plan that would result in unreported crime for things like domestic violence. Albuquerque's municipal election day is Tuesday, October 6. You can at four locations through Friday. When you do vote, I hope you think about who has the best chance to beat RJ Berry, whether it's by garnering at least 40% of the vote on election day, or beating him one-on-one in a run-off election on November 24. Vote with your head, not just your heart. You may have noticed that I haven't written much about the Albuquerque mayoral race. That's by design. Being a blogger, I get all kind of "tips" from friends and foes of candidates, mostly very negative stuff about a competitor. After awhile, it gets old. For one thing, I don't like to see myself as a stenographer. For another, I've developed a massive dislike of the incredibly negative tone this year, and the narrow scope of the issues that are being "debated" in this race. Can it really be that the two Democratic candidates have joined the narrow-minded "law and order - lock 'em up - three strikes you're out" crowd without any hint of shame? This used to be the territory of the Spiro Agnews and Ronald Reagans of the world -- not of Democrats who knew the issue of crime was complex. Dems traditionally were dedicated to studying the real roots of criminal behavior in order to change the conditions that cause crime. Yes, punishment was a part of that, but other factors were considered pivotal as well. Now it's slogan city for both Marty Chavez and Richard Romero, as well as Republican RJ Berry. Who's "tougher on crime" in this race? The dialogue starts sounding like something from an old cowboy movie. Round 'em up and hang 'em! Very little consideration is being given to the power of intervention, education or counseling in reaching and helping to reform what amounts to a poverty-stricken underclass who have little hope of moving up in the ranks except via criminal activities. When decent-paying jobs are available and folks who've had trouble in their youth can be counseled and trained to fill them, crime goes down. Duh. I guess this year's crop of mayoral candidates hasn't noticed that America's jails are full to the brim, and yet the alienated and unemployed underclass, as well as the underpaid segment of the working class, keep on growing. More cops on the streets and more jail terms aren't really a cure all. I find many of the other "issues" in this campaign to be nothing more than surface static. And, not surprisingly, I find RJ Berry to be a disaster in terms of almost every aspect of his candidacy. RJ Berry is a hypocritical Republican who brags about his abilities to run Albuquerque like he runs his business, except that the business under his name is pretty much dormant. Instead he's been raking in the big bucks by having his Hispanic wife establish a company called Cumbres Construction -- and gaining access to $48 million in defense contracts from 2000-2008 -- helped along by the points the business gets due to her minority (woman, Hispanic) status. RJ is just the project manager, you know. Ah, the irony of a right-wing Republican going out of his way to take advantage of minority benefits that the GOP has spent decades framing as a nasty giveaway to undeserving people. Berry is also hot to trot about Albuquerque's alleged status as a "sanctuary city," which is a massive exaggeration about a common sense rule meant to encourage undocumented immigrants to report crimes without fear of repercussions about their immigration status. Berry uses it in as a ploy as do many on the right -- utilizing code words as dog whistles to less than open-minded potential voters. He might as well say, "It's those dangerous Mexicans crossing the border who are causing all the crime in Albuquerque." Then there's the battle over who'd jettison more jobs in city government, and who'd do it faster. It pains me to hear Richard Romero pushing for staff cuts as a first priority -- after all, most of the "in-kind" jobs he says Chavez has added are slots for assistant city attorneys, 311 Call Center operators, veterinarians and animal-care officials. Romero has also been bagging ideas about an events center in downtown Albuquerque and the kind of light rail every city with an eye on the future has already built and is expanding upon if they can. This is supposed to pass for a positive vision for Albuquerque's future? And of course you've heard about the huge issue of the scandalous trip Mayor Marty took to Paris -- after being invited by the French government, which footed much of the bill. Sadly, we've been subjected to this kind of direct mail tripe (and robocalls) way too often in this election cycle. Meanwhile, the serious and complex challenges we'll be facing in a world dominated by dangerous economic and climate-based problems are ignored or given short shrift. And What About Marty Chavez? I certainly don't agree with him on any number of issues. But I do think the Mayor has done many very good things for Albuquerque, along with some very questionable ones. He can be informed and enthusiastic about green energy issues and has been very effective touting Albuquerque as a world-class city around the nation and beyond. He's probably the best salesman for the city we've had since Clyde Tingley. He's passionate about bringing amenities to the city that are appropriate to the 21st century, and that can attract employers. After three terms, we all know his weak points, as well as his strong points. He's certainly not perfect. Like most politicos, he's a mixed bag. But I do think Chavez has the capacity to be a great mayor -- not just a good one -- if he'd stop with the feuding and give up on the crazy idea of SunCal TIDDs. As for the SunCal issue, does anyone really believe that any new big developments are going to be built anytime soon in America? It's essentially become a moot point in this election given the economy and this era of tight loan funds. I won't be voting for or against a candidate primarily on this issue. Divided Dems = Right-Wing Republican Mayor? My worst nightmare is that there's a very good chance our two Dem candidates will cancel each other out and permit a very conservative Republican to win the contest -- thanks to the crazy "nonpartisan" nature of the election. Remember, Berry is getting lots of help from the Republican Party in this race, while the two Dems are on their own. This kind of help falls into a gray area in the nonpartisan race, but Berry's campaign says it's OK because the GOP has registered as a "measure finance committee." Because two Dems are candidates, the Democratic Party would be precluded from doing that, even if they determined it was kosher. I can't imagine a right-wing throwback to the 1950s running Albuquerque in the 21st century, apparently hoping to attract jobs by spouting the tired mantra of "marriage is only for one man and one woman." Most clean, high-tech and green-tech companies are progressive employers with a significant number of LGBT workers. They'd think more than twice about starting up any ventures in a city run by a mayor who believes only some of Albuquerque's citizens are deserving of their full civil rights. I mean, Berry doesn't even support domestic partnerships, never mind marriage equality. If we want to be seen as a backwards town still operating like it's black and white movie time, RJ Berry is our guy. And it could happen -- if Dems don't understand the dynamics of this race. I'm sure by now you've seen the latest polling done for the Albuquerque Journal that shows RJ Berry leading with 31% of those surveyed, Marty Chavez with 26% and Richard Romero with 24%. A whopping 19% of the "likely voters" polled were undecided. Does that mean they're really undecided or that they're so uninspired by the campaigns that they'll be staying home on election day? A candidate has to get at least 40% of voters in the October 6 election to avoid a run-off between the top two vote getters that would occur on November 24. I have my problems with how the polls conducted by Research and Polling are reported in the Journal. The paper never publishes the full poll results, including cross tabs that provide info on the samples, questions and breakdowns of voters. Instead we get just what the Journal wants us to see. Convenient. But say, for the sake of argument, that the Journal poll is accurate. That means the Republican candidate has the support of only 33%, while the two Dems in the race have a combined percentage of 50%. It also means that Berry could be the winner if the supporters of the Dem who doesn't get into the runoff refuse to vote for the one who does. And I can surely see that as a possibility -- especially since Romero has spent almost the entire campaign trying to take Marty down in often nasty ways. In fact, Romero has even gone so far as to join forces with Berry at press conferences and candidate forums to bash Chavez in tandem. That always helps the Dem cause. It's also a well known fact that many Romero supporters simply can't stand Marty Chavez, and vice versa. Will they vote for the other Dem if he's the runoff candidate? Or will they let a Republican take the reins in New Mexico's biggest city? Can we really afford to have RJ Berry as mayor at a time when it would clearly be a disaster to have the failed policies of the right dominating our local government? Personally, I don't think Romero has much of a chance to win, especially if he gets in the runoff. I highly doubt he could get many Republican votes to bolster his totals against Berry or Chavez. And he doesn't seem to have the momentum to get 40% of the vote, given that his voter base is almost exclusively Democrats, with a significant number of "progressives." If the polling in the Journal is accurate, and Berry IS in the lead by 5 points over his nearest competitor -- and that holds thru October 6 -- what can we do to prevent a Republican takeover of the mayor's office? I know many progressives won't like my answer, but I think the prudent thing to do is vote for Marty Chavez. Yes, that's right. Voting, especially in a three-way race, often has to be strategic if the worst result is to be avoided. It doesn't look to me like Romero has run a campaign powerful or inspiring enough to put himself over the 40% mark. And it seems to me that Romero would have a real problem beating Berry or Chavez one-on-one because he's attracting few crossover votes from Republicans and independents. So what will I do on October 6? I'm going to vote for Marty Chavez. There. I've said it. You know as well as I do how critical I've been about the Mayor over the years. That's not negated. But given the state of the race and the real possibility of a right-wing mayor getting elected who's horrible on LGBT rights (and many other issues), I think my vote has to go to Chavez. 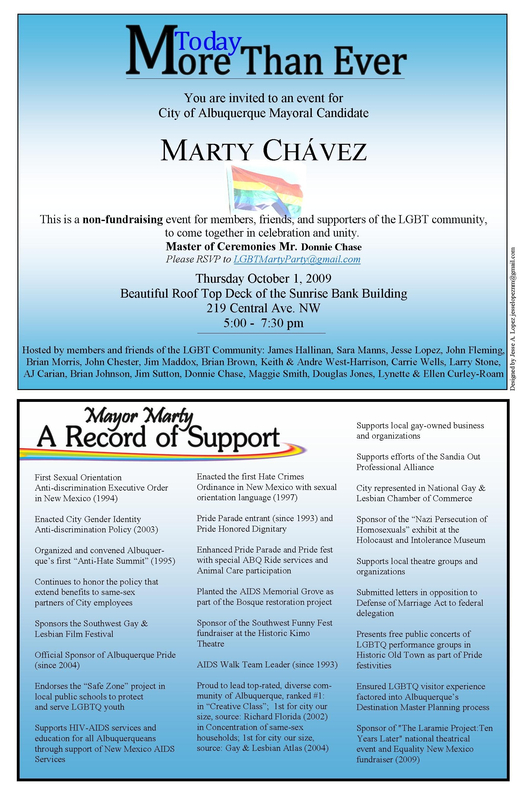 Chavez has supported equal civil rights for LGBT folks for many years. Better yet, he's comfortable with LGBT people. It's not just a pose or an abstract position. I know Romero finally said the words, "I support gay marriage" at a recent debate, but it sounded pretty flat and unenthusiastic to me. I can't help it. And, sadly, when Romero appeared at the DFA-DFNM Meetup a few months ago, he answered a question about marriage equality by saying he wasn't taking a position because a mayor has no power in that regard. Needless to say I was bummed about that, especially since Chavez had voted for a marriage equality resolution that was passed unanimously this year by the US Conference of Mayors. When Chavez came to our Meetup, he took on all questions -- even the tough ones -- and gave a strong answer on LGBT rights. The positives about Marty Chavez? He knows the ropes and he wants very badly to leave a positive legacy. He's pumped by green energy -- even if his accounts of his accomplishments are sometimes a bit exaggerated. He thinks big and he thinks progressively on many issues. I believe he's got a depth of experience that will serve him well in the challenging years to come. And I believe he could easily mend some of the rifts that have opened up during his mayoral career. If he wanted to, I think the Mayor could help heal relationships between the city and the state and other entities -- and between himself and the Democratic Party -- by mellowing out some and ditching the tendency to hold grudges and seek revenge. If he's to have another four years to add to his 12 years as mayor, he doesn't need to sweat the small stuff. He needs to reach out and bring people together as we head into an era with profound and complicated challenges. Will he do it? We can only hope he does, for the sake of Albuquerque and all who live here. Bottom line: I have some problems with both Democratic candidates, but I've made a decision to vote for the one I think can best take down Republican RJ Berry. That candidate is Mayor Marty Chavez. There is no real ideological purity in this race -- except for the right-wing ideologue Berry. We have to stop him now. I intend to do that by voting for Marty Chavez.